Description: "Friends of Kevin" radio show (WSMN 1590) host Kevin Willett and EMH teacher and program coordinator, Mrinmoyee Das, talked about a range of topics, from why EMH is called a "house" and not a "school" and why preschools have graduation ceremonies, to the upcoming 20th school year at EMH. 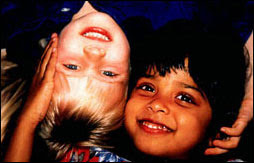 Description: "Friends of Kevin" radio show (WSMN 1590) host Kevin Willett and EMH teacher and program coordinator, Mrinmoyee Das, talked about the value of preschool education. Description: "Friends of Kevin" radio show (WSMN 1590) host Kevin Willett and EMH teacher and program coordinator, Mrinmoyee Das, had a great conversation about the Montessori Method and program at EMH.